I catch myself every now and then, staring into the refrigerator. If it weren’t for the high price of electricity and the non-greenness of it, I could stand there for days. Weeks even. I stand there waiting like I’m expecting the refrigerator to say something to me. Now if I’m honest, which I always am (wink, wink, nudge, nudge), this often happens late at night when I’ve been woken up by the neighbor’s cat or a bad dream about income taxes (and aren’t they all bad?). So I stand there until my eyes hit a jar of pickles. I smile. My stomach stops churning and my mouth starts watering. 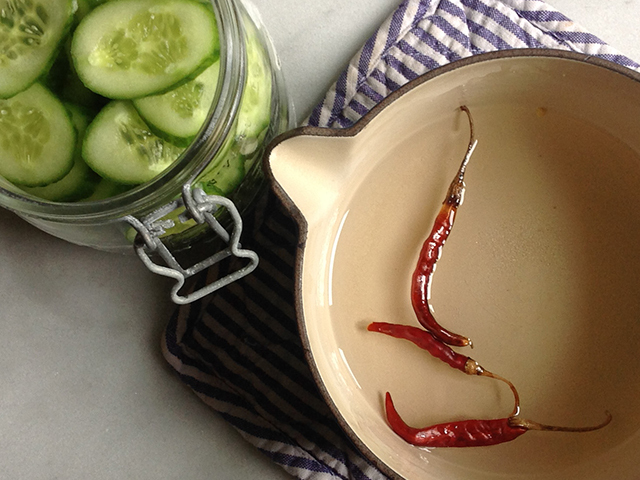 Because pickles are the perfect thing to have on hand when you just need a little something. When a burger with cheese, grilled onions, and sautéed mushroom would simply be over the top. Not to mention there’s no sign of meat, onions or mushrooms anywhere in this fridge. No, a couple of pickles eaten late at night by the light of the refrigerator can be just the thing. It satisfies that peckishness you have. It tells you all (or at least a whole lot) is right in the world. So you slurp and nibble until ready to go back to bed. Two caveats. If you’re looking for how-to-can 101, then you came to the wrong place. These pickles are fine and dandy in the fridge for a week or so but if you want to whip up a batch and set ‘em aside for your daughter’s wedding in 18 years (be honest, she’s only 1 ½ now), then you’ll want to get some advice on preserving like how to clean the heck out of a jar. Second point. This was inspired by the most inspiring of foodie blogs Food52. I bow down before them. I’ve used rice wine vinegar instead of cider vinegar but either is great. And of course, I added chile. Natch. Feel free to add more chile but remember, it gets hotter the longer it sits. 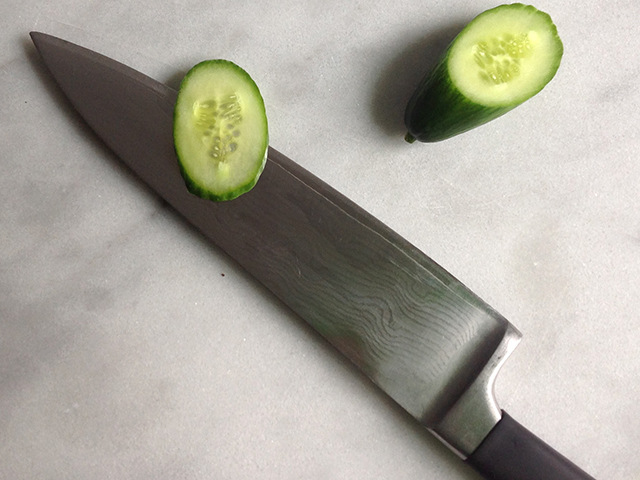 Slice the cucumbers as thinly as you can without removing a finger. Place them in a clean jar – I’ve used a .75 liter jar here but don’t get fussy. 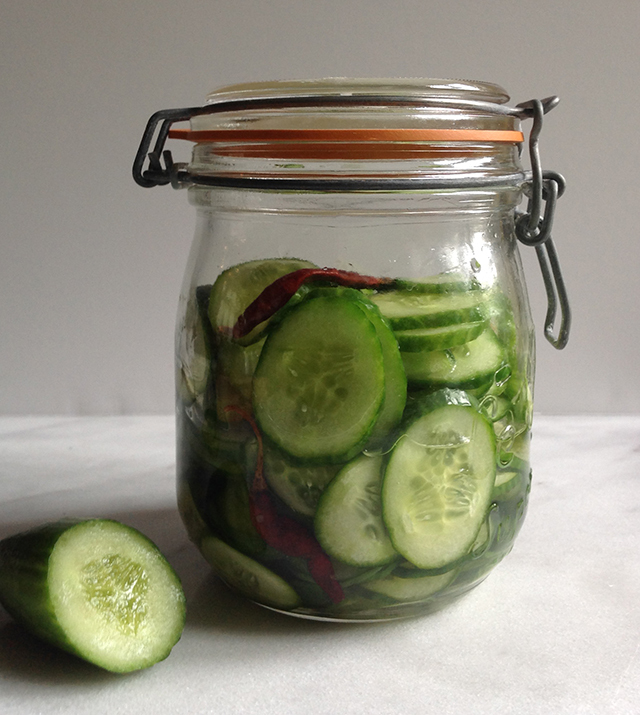 You want the cucumbers to fit in nicely with some room to top it up with the pickling liquid. Place the remaining ingredients in a small saucepan. Bring to a simmer, reduce the heat and stir until the sugar is dissolved. 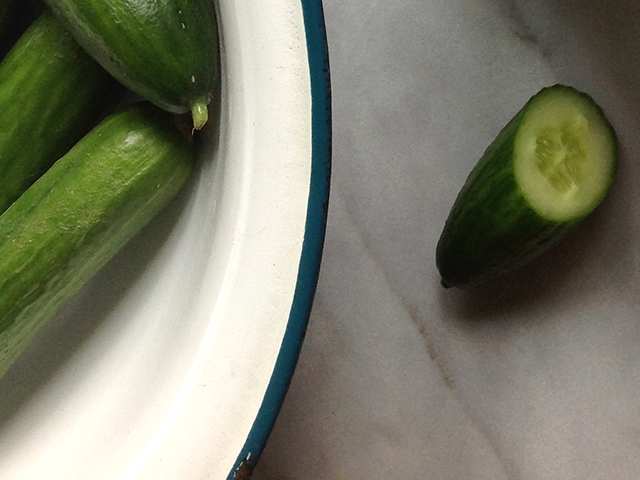 Remove from the heat and pour over the cucumbers. 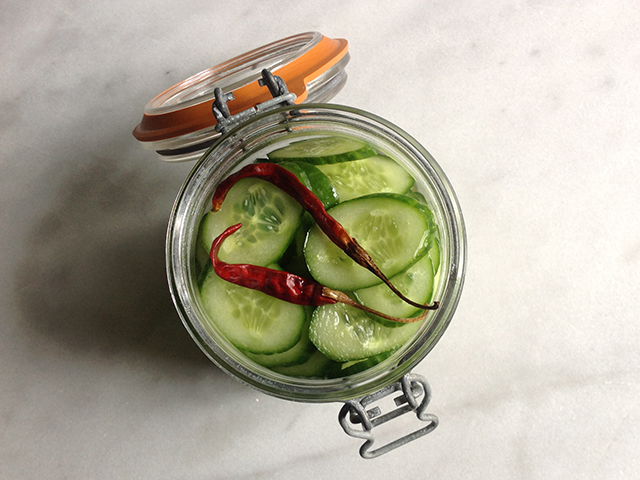 Don’t worry if the liquid doesn’t cover the cucumbers (because it won’t). The cucumbers start to go soft and yummy soon enough. Let sit at least 4 hours then get eating. Keep in the fridge if there is anything left.